The polynomial 2x + 8 can be modeled by the rectangle below. Step 1 Gather the appropriate tiles. Step 2 Arrange the tiles in the shape of a rectangle. Thus, 2x2 + 8 can be factored into 2(x + 4) . To check, simply use the distributive property to see if you get the original polynomial back. Gather 3 of the positive x tiles and 9 of the positive one tiles. Then arrange them into a rectangle and write the dimensions of your rectangle. Gather an x² tile and 5 negative x tiles. Arrange them into a rectangle and write the dimensions. The above examples involved factoring binomials – polynomials with two terms. the examples below include trinomials. 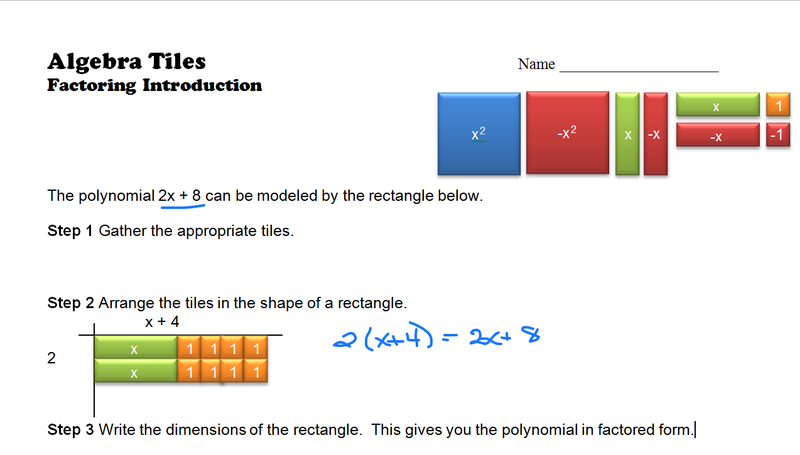 Factor x² + 5x + 4 using Algebra Tiles. Factor x² – 2x – 8.